Mexican food is famous throughout the world and no wonder, considering it has such a rich and long culinary heritage. Mexican cuisine has a blend of indigenous and Spanish influences with unique ingredients and cooking techniques, giving this cuisine a distinct taste comparable to no other in the world. The preparation of this fare also employ unique cooking tools such as the Molcajete (a lava stone mortar and pestle), the Matate (a lava stone “table” for grinding corn and spices) and the Comal. 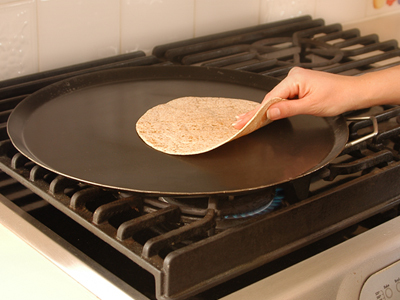 Simply put, a Comal is a griddle with a flat and smooth surface native to Mexico and Central America. A Comal is primarily used for cooking tortillas, as well as, for roasting vegetables and spices. Comals traditionally are placed on top of three or four stones for support, allowing a fire to be built underneath to heat the Comal. Of course, today most Comals are made of metal, and are placed on gas burners or stovetops, but the idea is the same. As its Aztec name (comalli) suggests, the Comal has its roots in Mexico since ancient times. The Aztecs used the Comal to char ingredients due to the added flavor it would lend to whatever was being cooked. The Comal became quintessential in the cooking of tortillas, which became a stable in the cuisine, and quickly spread down to the rest of Central America and parts of northern South America. Since then, the Comal has long become an essential utensil in Mexican Cuisine and found in most Mexican households. In fact, since they become seasoned over the years, some Comals are handed down from generation to generation as family heirlooms. Originally Comals were made with natural untreated clay, like the ones sold at AncientCookware.com. A Mexican Clay Comal, locally known as a comal de barro, is coveted by cooks for their slow heat distribution and retention. It is also the is the choice of exacting pallets since a well-seasoned Comal gives food an extra hint of flavor you can't get any other way! 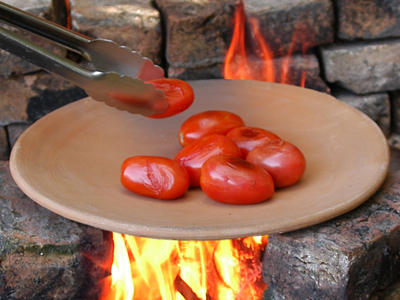 There are many ways by which this traditional clay cookware can be used. Some of its most common applications include roasting vegetables, toasting spices, and preparing tortillas. It is also used for searing meat and preparing quesadillas. The applications can be endless, limited only by what one wants to cook. Food Grade Lime is an inorganic compound of calcium hydroxide which is produced by heating limestone. It goes by many names including edible lime, dry lime, pickling lime and in Spanish, Cal. It is used widely in many applications such as additives in tortilla flour, for making hominy, used in home brewing, and in the pickling process. 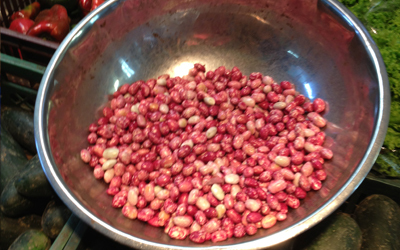 In Mexico and South America, it has been widely used for millennia to process corn, which after being soaked in water and lime, it loosens the kernels of corn from the husks. After the corn is treated in this way, it can be dried and ground into a corn flour such as "Masa Harina." Food Grade Lime is available in the canning section of many grocery stores or on on-line canning suppliers. Before using the Mexican Clay Comal, it is important to have it seasoned, which prevents the food from sticking to the surface as it is cooked. To season the Comal, it is slowly heated starting on low heat and slowly the temperature is increased. Using a combination of water and Pickling Lime (aka: CAL or Food Grade Lime), the mixture is spread on the surface of the Comal using a brush. The Comal is then heated until the lime on the Comal hardens. Once the Comal has cooled down, it is rinsed and ready to be used. One important thing to note when using a Mexican Clay Comal is that it is very fragile, and hence, proper handling and care will be necessary. It must be handle with caution and clean it regularly. In order to keep it from growing mold, it must be stored in a cool and dry place making sure it is clean and thoroughly dry prior to storing. While using a Comal, metal utensils should not be used as it can scratch the surface. Make sure that temperature adjustments when using the Comal is done gradually, because as with any Clay Cookware, abrupt changes in heat can cause it to crack. Some people prefer the Metal Comals, specifically Carbon Steel Comals, like the ones sold at AncientCooware.com because they are more practical than Earthenware Comals. They are certainly lighter, and have the advantage of not being fragile, and lasting forever with the proper care. Carbon Steel Comals, like cast iron skillets, becomes seasoned over time and lend the foods cooked on them little extra hint of flavor. In contrast, modern nonstick skillets lend nothing to the food. The dry roasting of ingredients on a hot Comal builds layers of flavors with the charred skins of the vegetables adding extra flavors. A Carbon Steel Comal is perfect for roasting vegetables & chilies, as well as for making quesadillas. Street vendors in Mexico are often seen making quesadillas on HUGE Carbon Steel Comals. Much like a cast iron skillet or a wok, a Carbon Steel Comal needs to be seasoned before use. After washing it for the first time, the Comal needs to be covered with a generous coating of oil, and placed on high heat for about 30 minutes. As the oil begins to heat and burn, it will also darken the Comal and make it ready for use. The seasoning process will require the oil to burn at a high temperature which creates smoke, so the process is always done where there is adequate ventilation such as with an open window or an appropriate kitchen hood. The Comal is heated by simply placing it over a heat source to bring it up the desired temperature. The Carbon Steel Comal, including the handles, can get very hot, so care should be taken when handling. It is best to let it cool before attempting to move it. A Carbon Steel Comal is very easy to take care of, however, if not cared for properly, IT WILL RUST. It must be cleaned after each use and dried by heating to ensure that all moisture has evaporated. After heated and cooled, the Comal must be coated with a thin film of oil covering the entire surface to prevent rusting. It should never be left to air dry. If rust ever does appear, the Comal can be restored by simply being washed with hot water then removing any traces of rust using steel wool if necessary. The Comal is then re-seasoned will be good as new. Situated northwest of the country’s capital of Bogota, Medellin is a city known for its vibrant atmosphere, lively plazas, and beautiful fertile mountainous surroundings. Medellin is also Colombia’s second largest city. 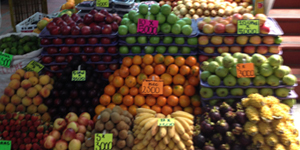 One of the jewels of the city is the Plaza Minorista – a massive commercial market located right downtown. It boasts everything from fresh meats, fruits, and vegetables to shoes, clothing and almost anything else in between. Of course, our draw to the market was the food, both prepared and unprepared. It is hard to pin point what exactly makes this one of the best plazas in town, but it was certainly one of the many highlights of our trip. 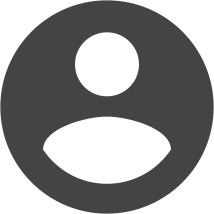 In fact, we loved it so much that we wanted to share with you the following information that will hopefully prove to be useful the next time you find yourself in Medellin, Colombia. 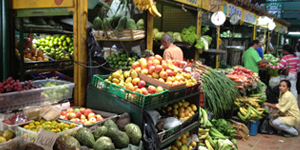 There are over 2,500 stalls at Plaza Minorista; meaning that you certainly won’t be in any shortage of goods! The market has two floors, each divided into sections. One such section features fruits and vegetables, so fresh you can even smell the fresh dirt on root vegetables. 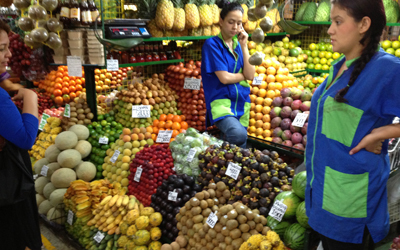 All locally grown, the fruits and vegetables are neatly stacked and arranged. Many of the items offered are not common in the US. 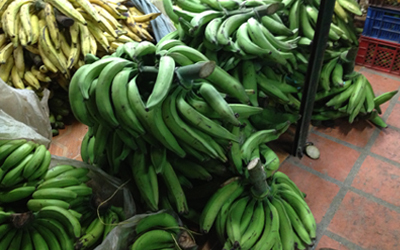 There is an entire section for Bananas and Plantain, a staple of the Colombia Diet, and another section for beans and root vegetables. 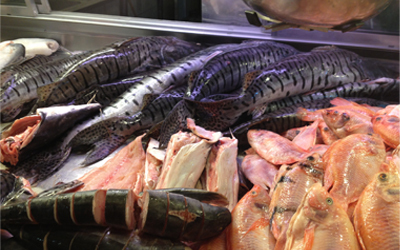 There are also sections for meats, poultry and fish, which are definitely not for the squeamish at heart. 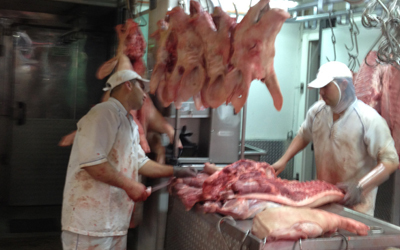 Animal carcasses hang behind counters and are butchered right before your eyes. The poultry sections has live animals. 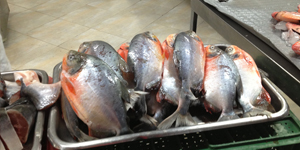 The fish stall offers all kinds of delicacies, including fresh water fish, some from the Amazonian rain forests. Another great section contains lacteous products, cheeses and eggs. 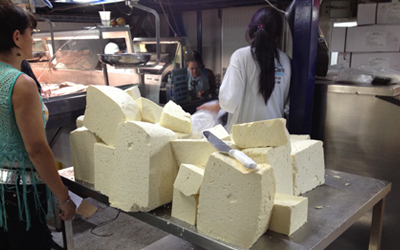 Different stalls offer a great selection of locally produced aged and fresh cheeses. Originally established to feed the workers of the Plaza, in the back of the second floor is a section with prepared food stalls. When we were there we had Sancocho de Bagre, or fresh water catfish soup. The fish is cooked along with potatoes, yucca, and plantains, with its richness coming from the coconut milk (see the recipe on our recipe section). It is said that there is nothing better for a hangover than Sancocho de Bagre. If it is your first time visiting a market or plaza like that of Minorista, you may want to allow plenty of time to see as many stalls as possible. The people the work at the plaza are typically friendly and ready to help answer any questions you may have, which makes the experience all the better! Plaza Minorista can easily be reached by public transportation taking advantage of either a taxi or the metro – getting off at the Estacion Prado stop and heading a few blocks east where you will eventually come to a grand brick entrance. The hours of the plaza are Monday thru Saturday from 4:30am to 6pm and Sundays 4:30am to 3pm. We hope you’ll have just as much fun paying a visit to Plaza Minorista as we did!